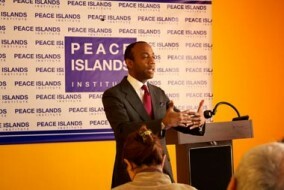 Thursday February 23rd 2012, the Peace Islands Institute hosted Mr. Cornell Brooks to celebrate "African-American Heritage Month." He said, "This afternoon's celebration commemoration of African-American history month occurs at a peculiar moment in our civic history. It occurs at a particular and peculiar hour in the history of our democracy. It occurs at a particular date in the history of our post-racial democracy. It occurs at such a time where we have an African-American in the White House. We have African-Americans at the helm of some of America's most prestigious law firms. We have African-Americans leading some of our most prominent and prominent cities. We have such a mayor here today. We have such a mayor in this city of Newark."